Taking a vacation break is important, not because of the year’s season but because of the need for people to relax at a specific location where isolation becomes an effective factor in relieving stress and reliving life. However, even if the purpose of heading for a vacation is to release stress, finding the right spot for a fun and memorable vacation is not an easy piece of cake to fulfill especially when it comes to searching for a place to spend the night in. This is the reason why there are property owners who offer their properties to be rented out by vacation goers for a limited time. And to ensure that responsibilities and obligations are informed to the tenants of the properties, a vacation rental agreement form must be drafted and finalized by the owner along with the tenant and the guests. 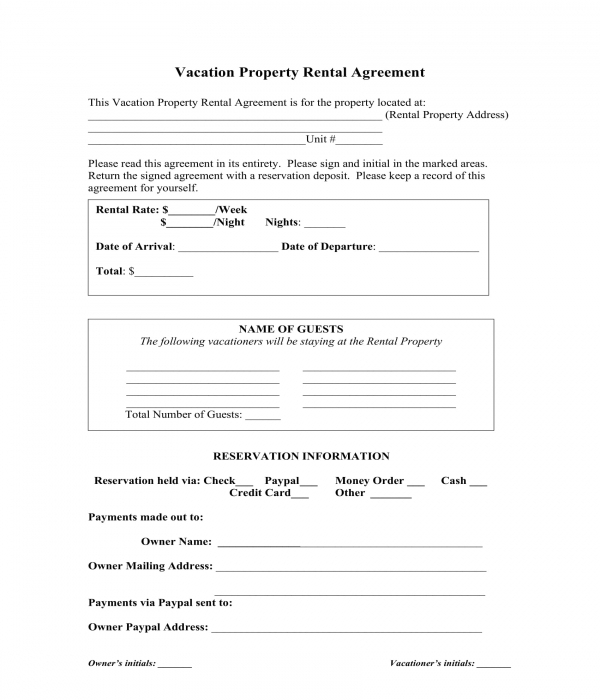 What Is a Vacation Rental Agreement Form? 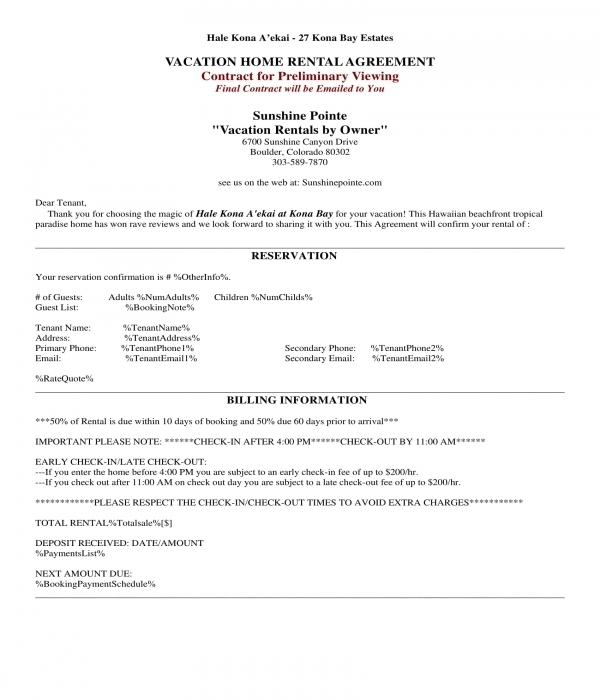 A vacation rental agreement form is a document specifically used by vacation house owners whose aim is to lease out their properties to tenants who will be staying within a period of time for the purpose of a vacation. The form is identical to basic rental agreements for renting rooms and houses, however, compared to the aforementioned documents, this form is only applicable for shorter lease periods such as for a whole day or for a week wherein the tenant will be staying and using the amenities of the vacation house. 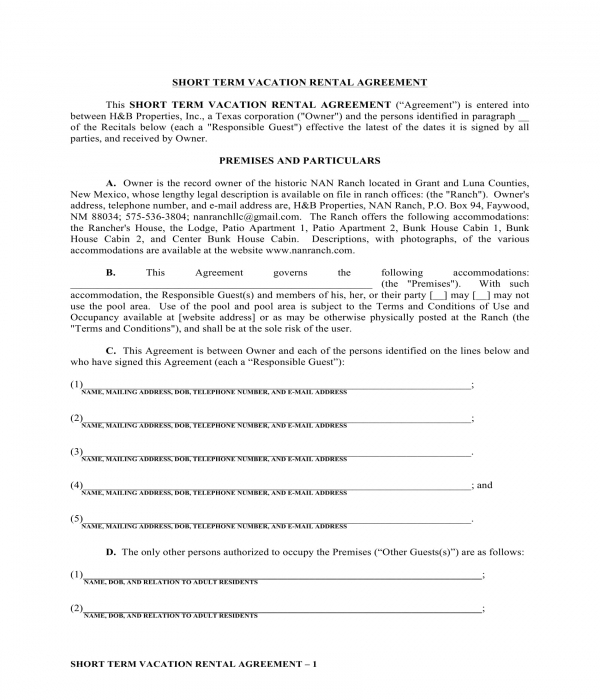 Short Term Vacation Rental Agreement Form – Vacation rentals are often short-term leases which is why a short-term vacation rental agreement form is the exact document needed by vacation house property owners for their clients and tenants. The form contains four main sections which are divided into subcategories for easier interpretation of what needs to be known by the tenant who will be renting out the property. The first section of the form centers on the premises and particulars of the property which are included in the tenant’s rent or lease. In addition, the first section also identifies who the parties are and where the location of the property is. 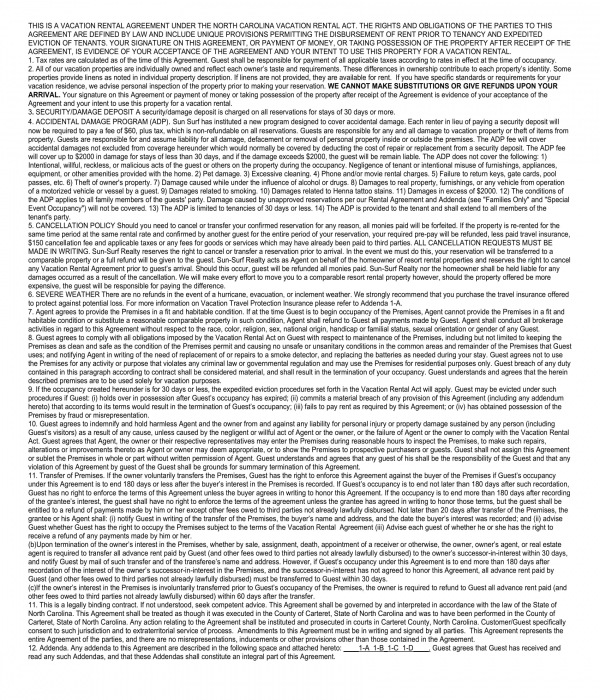 Some details which are stated in the first section includes the addresses and the contact information of the tenants, the rental charges and security deposits to be paid by the tenant, and the tenant’s credit card number if he prefers to pay his rental fees and add-ons through his credit card account. Vacation Rental Agreement Addendum Form – An agreement or a contract addendum is a document which is to be signed by the involved parties of the agreement in order for them to mandate additional rules and regulations pertaining to the formerly established terms and conditions in the form. With a vacation rental agreement addendum form, the tenant will be able to specify the event or the occasion wherein they will be needing to rent out the vacation place. The addendum also includes the special requirements which should be acknowledged and met by the involved parties to ensure that the agreement is understood and effectively executed not only by the vacation property owner but also by the tenant or the renter. 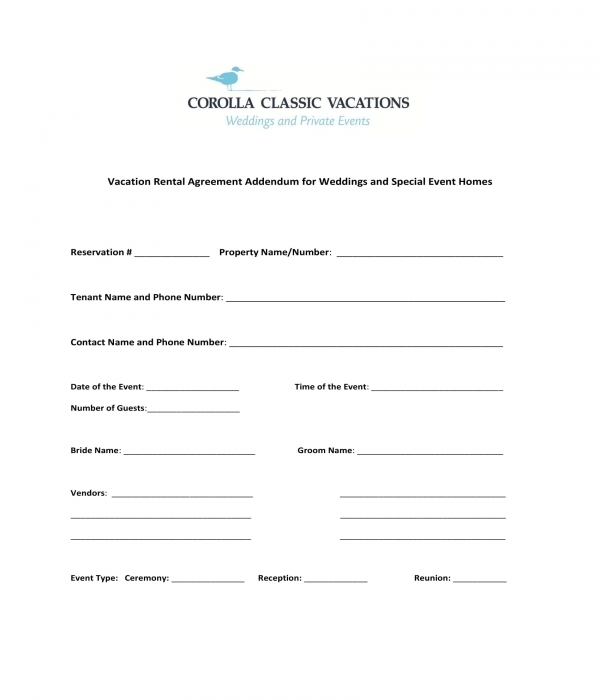 Vacation Rental Exclusive Right to Lease Agreement Form – There are companies and organizations whose main objective is to provide services to property owners who want to lease their properties during a specific season or period. For these types of organizations, a vacation rental exclusive right to lease agreement form should be created for their associated clients or property owners. In this form, the company will be able to gather the property owner’s general information along with the description of his property as well as the varieties of rental fees or payments that the company will be mandated for the property’s clients and prospective tenants. Both the owner’s and the company’s obligations are all defined in the form with the miscellaneous terms necessary to be included in the agreement. Other pieces of information to be stated in the form are the details of the agent who will be responsible for encouraging clients to rent out the vacation property of the owner and in informing the owner for the process and the progress of the property rentals. 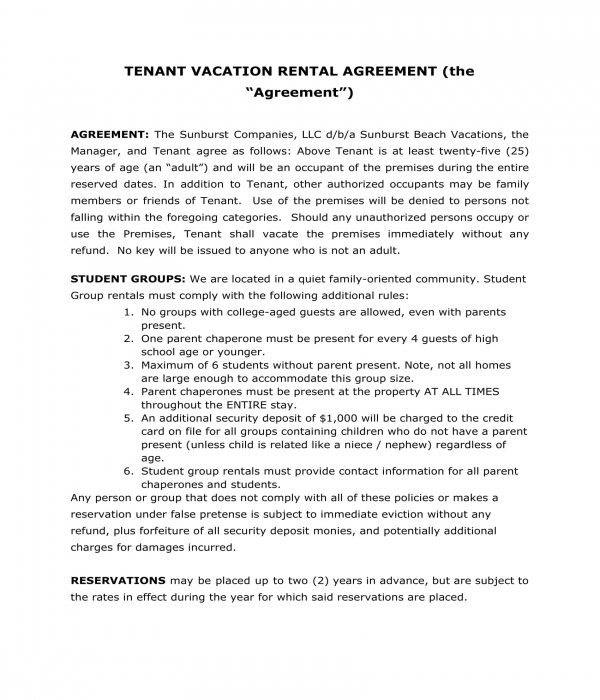 What to Include in a Basic Vacation Rental Agreement Form? Tax inclusions – When one begins to open a business, he should be aware of the taxes that he will be paying throughout the period of his business operation. The taxes which will be included in the rental fees and prices to be provided by the tenant should be properly indicated in the form. This is to ensure that the tenant will not be held by surprise to the additional payments that he will have to give before he will be handed with the keys to the property. In addition, the property owner must also ensure that his tax requirements or add-ons to his tenant are based on the tax regulations of the State and the business that he is managing. Deposits and refunds – Most vacation rentals businesses are often near ocean shores and resorts which is why it is essential that the property owner will indicate his rules and regulations regarding the tenant’s security deposit and refunds especially for factors relating weather changes. The owner must state in the agreement form his requirements for the amount of deposit that the tenant must provide along with the rental payment. Moreover, whether or not the property owner allows refunds should also be indicated in the form to help the tenant in deciding to either rent the property or look for other options for their vacation which meets their needs and expectations. Reservations and cancellation policies – Plotting a reservation requires a client to fulfill the payment fees which accompany the reservation options of a business. With the reservation information of the property owner, the client or the tenant will be able to know how much he should expect to pay in addition to the basic rental payments. Along with the reservation information of the vacation rental agreement, cancellation policies must also be stated by the owner. The policies are intended to mandate rules and ensure that the tenant is knowledgeable about his obligations towards informing the owner if he will be canceling out his reservation or be leaving the place earlier than they have agreed on. Hold harmless agreement – A hold harmless agreement section of the form is significant for the security and the safety of the property owner especially when it comes to dealing with legal matters in relation to cases and lawsuits filed by a tenant. With this type of agreement section, the tenant will be informed that any damages he caused in the property, as well as any incidents leading to a guest’s injury, will be liable to him and not by the company. This also entails that the damages and the medical expenses associated with the incident in the property will be paid by the tenant before they will be released or be terminated from the lease or rental. Termination and contract breach – A breach of contract happens if one of the involved parties failed to meet his responsibilities and obligations which are stated in the contract form or in the agreement. The resolutions for the breach should be defined in the form which will allow both parties to determine how they can solve the breach concerns and still be able to cater to the needs of each party. Additionally, the period of when the agreement will be terminated is also important to be included in the form which will distinguish the number of days or weeks and months when the tenant will be staying in the property for the duration of their vacation. 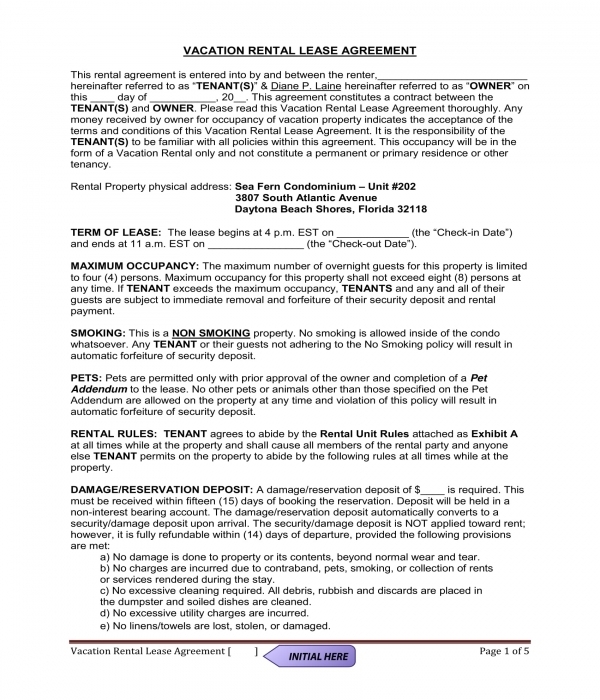 Contract legality statement – This statement serves as a tool for the property owner to prove that the constructed rental agreement is accepted as a legal form in the State where his property is located as well as his business is registered in. 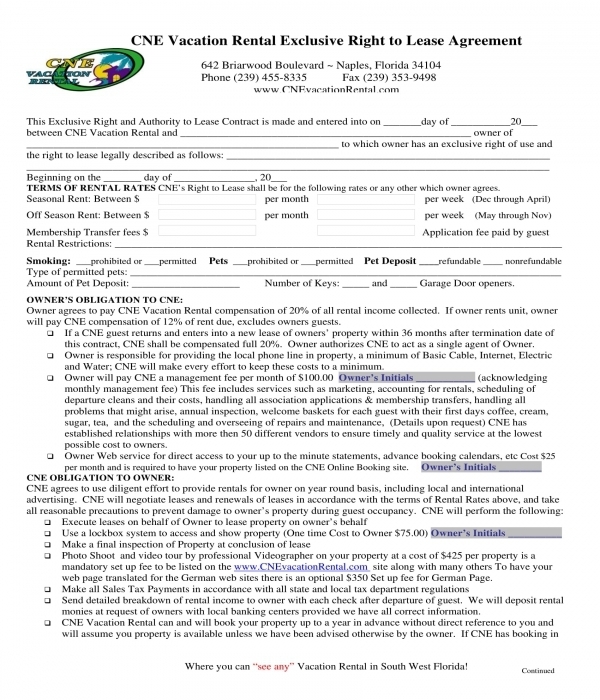 Regardless of the variety and the contents of a vacation rental agreement form, the property owner and the tenant who will be renting the vacation property must have a proper negotiation to ensure that both ends are met in the arrangement and that all concerns, issues, and inquiries will be answered prior to the signing of the vacation rental agreement forms and other associated documents.